Minamoto Yoshitsune had little going for him. As a fatherless child he was exiled to a monastery, had no money, had few friends and no allies, and had no martial arts training. But he was smart and determined, and he had a dream. At the age of fifteen, Yoshitsune escaped from exile, joined his half-brother, and led an uprising against the most powerful samurai in Japan. Pamela Turner spins a tale of courage, battles, cunning, and improvisation in a story that sounds like the adventures of King Arthur or Harry Potter. Except this story is true, and accompanied by maps of battles that really took place. It is also a story about shifting loyalties, political allegiance, love, and family. There are warrior monks, archers, and much clashing of swords. There is victory and defeat. Not only is it page-turning nonfiction, it is a perfect book to read this political season. If I gave out stars, this would get a galaxy's worth. 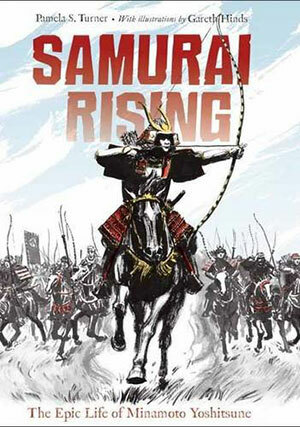 Pam Turner was kind enough to answer Three Questions about how she came to write Samurai Rising. Sally: Why did you want to write this story? Pam: When I was living in Japan (I lived there for six years), I read The Tale of the Heike, one of the great works of Japanese literature and history. Heike is a big sprawling story about the rise of the samurai in the late 12th century. Out of its many characters is Yoshitsune. His story reminded me of the tales of King Arthur, or our more modern hero, Luke Skywalker. Like them, he was raised in obscurity and grew up to be a great hero, only to discover that his greatest enemy was a member of his own family. But unlike the stories of Arthur and Luke, Yoshitsune's story is true. Sally: How did you do the research for this book? Pam: I started with about six months of straight research. I live near the University of California, Berkeley, and have access to their massive library. 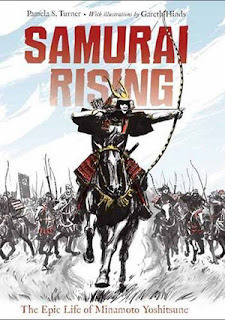 Luckily, all the primary sources have been translated into English, and quite a few Western scholars have written about this crucial period of Japanese history. All my sources are either primary sources or academic sources (as you can tell from my bibliography). I don't cut any corners because I'm writing for young people instead of adults. The actual writing took another year, during which time I continued researching. Sally: What’s your secret for writing page-turning nonfiction? Pam: "Page-turning" nonfiction is partially a matter of finding the right subject. I think it would be hard to write a boring book about Yoshitsune! Partially it's a matter of pacing; it's important to alternate explanatory bits with some sort of action that moves the story forward, and also to make the explanatory bits intriguing enough that they don't read like explanation. And lastly, how you end a chapter is crucial. If you end on a cliffhanger, the entire chapter will be remembered as "fast-paced". Check out Yoshitsune’s World at Pam’s website. Click on “Enter Yoshitsune’s World” and you’ll find videos, photos, and more. On Monday we'll the roundup over at the Nonfiction Monday blog where you'll find even more book reviews. Review copy provided by publisher. "The killer was a master of stealth. It moved undetected, sneaking from victim to victim and always catching its targets by surprise." How can you resist reading on? In this, her third in a series of books on deadly diseases, Gail Jarrow skillfully blends medical mystery, history, and a dose of political nonsense. Bubonic plague went by many names: The Pestilence; the Great Mortality; Black Death; and The Plague. It was marked with high fever, headaches, weakness, achiness, chills - sometimes nausea and diarrhea. Corpses piled high. Nobody knew who - or what- the killer was. Doctors tried their usual remedies, from bleeding with leeches (1600s) to sterilizing victim's homes - or burning them (1800s). By the 1894 outbreak in Hong Kong, doctors thought it might be germs, and they began looking for the culprit. Sure enough, it was a bacteria. But identifying the deadly microbe was only part of the battle. Scientists and public health officials had no idea how it was transmitted- plague victims often caught the disease even though they had no contact with another victim. Could it be rats? People living in rat-infested buildings got sick. But people who handled rats that were dead longer than a day didn't catch this disease. Could it be fleas, wondered scientists? And - in a world where ships traveled across the globe - how could health officials keep infected rats, fleas, and people from introducing plague into the local population? It was only a matter of time until plague reached the shores of the US, in Hawaii and San Francisco. While doctors and scientists worked to learn more about the disease and develop vaccines, local politicians fought against quarantines. Shutting down ports was bad for business, and if word got out that there was plague in town then tourists wouldn't visit and the economy would suffer. When news finally did leak out, papers across the country ran headlines warning that tourists were fleeing "plague stricken" San Francisco. When quarantines were instituted, enterprising lawyers sued the town claiming discrimination. The quarantine barricade curved to include a Chinese grocery store but not the neighboring business owned by a white man, he said. 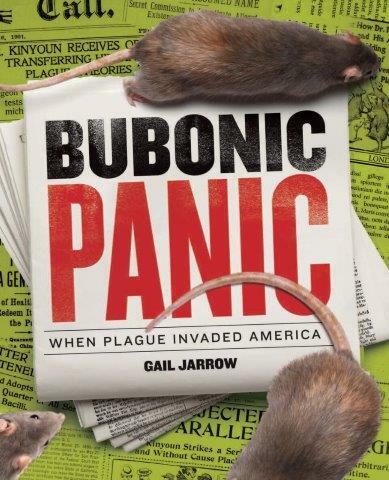 I caught up with author Gail Jarrow last week and asked her three questions about her book and the plague. Sally: What inspires you to write? Gail: I loved reading when I was a kid, and once I learned that I could put my thoughts on paper, I fell in love with writing. Sally: Plague is still around - last year the media reported that a teen in Oregon was infected. Gail: Yes, but plague is only found in the arid parts of the western US. It's not just found in rats, but also in other rodents - burrowing animals that live in colonies, like prairie dogs and ground squirrels. In shared burrows, fleas don't have to hop very far to get on a new host. Sally: Why was it so hard to figure out how to treat Bubonic plague? Gail: For many years people thought it was spread by a germ. The "germ theory" was fairly new, and when they cleaned up homes and burned seriously infected areas, they reduced the rat population. The resulting decrease in plague cases made it look like it was a germ that was the culprit. Gail's other books in the "deadly diseases trilogy" are about Pellagra and Typhoid. 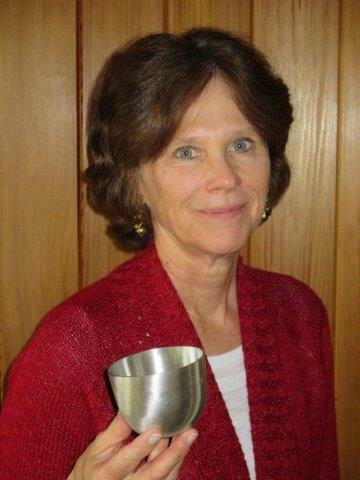 Learn more about Gail and her projects at her website. As for her next project, it's about hoaxes and gullibility. "We need to be more skeptical about the news we hear and read," she says. On Monday, May 16 the Nonfiction Detectives hosted a post. Giveaway ends on Thursday, May 26. Today's review is part of the STEM Friday roundup. Drop by STEM Friday blog for more science books and resources. Review ARC provided by publisher. Last week the focus was on a fictional dog doing rescue work. 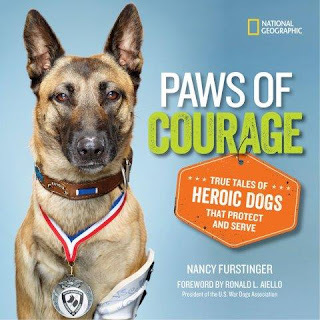 Paws of Courage contains 22 stories about real dogs doing real work with their military or police partners. It begins with tales of "historic hounds" - military dogs serving in World War I and World War II. Like "Sergeant Stubby", a pit bull-terrier mix serving in the infantry, who captured a German spy single paw-edly. Then there's "Smoky", a tiny Yorkshire terrier no bigger than the shoe of his soldier. Smoky rode in a backpack, shared K-rations, and helped string wires through a pipe beneath an airstrip. Around 2,500 military dogs served in Afghanistan and Iraq. Their jobs included searching for explosives hidden in homes, car bombs, roadside IEDs, and weapons. Some worked with medics, others with special forces, parachuting from planes with their handlers. Like their humans, military dogs received care packages - though theirs contained dog booties and cooling vests. Search-and-rescue dogs work with police and fire rescue teams to help locate people trapped in rubble after earthquakes, tornadoes, and other disasters. Others are trained as lifeguards, or work with search teams to find lost hikers. Some dogs are trained to sniff out agricultural pests, drugs, and other things sent by mail or air cargo. Review copy from publisher. This is the third of the "Dog Chronicles" and another great tale told by the tail-wagging protagonist. Yes, as with the others in this series (Darling, and Murphy) the story is told in first-person from the point of view of the dog. "My nose twitches. I am on the scent of rabbit on the brush and quail in the tall grass. The rabbit trail winds into a mound of thorns. When I poke my head underneath the branches, the perfume of ripe blackberries makes me drool." Alison Hart creates a universe in which it makes total sense for a dog to be telling a story. But what makes it really cool is that this story is grounded in fact. In history. In a real town (Cherry) in Illinois. The dog's boy is Thomas. Finder and Thomas live with Uncle Eddy, who hasn't the time nor money to house a dog that doesn't work. Despite his name, Finder isn't very good at flushing out game. 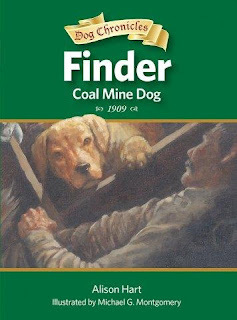 Finder gets lonely when Thomas is sent to work in the coal mine. But - tailwagging joy!- one day Thomas comes home with an idea: Finder can work with him in the mine. Pulling a wagon full of coal through a cramped tunnel way below the surface of the earth is hard work.... but Finder can do it. And when a mine fire breaks out, he discovers he can do even more. This is a tale of historic adventure - and I don't want to spoil the ending for you, but I will say that Finder lives up to his name. What I especially like about this book and the others in the "Dog Chronicles" is the back matter. Hart tells about the Cherry Mine disaster that inspired this story, and about the animals that lived and worked in the mine with the miners. Hart also introduces us to a modern day mine rescue dog, Ginny. Ginny is the first dog specially trained for underground and surface mine rescue. You can lean more about her in this short video. On Monday we'll join the Marvelous Middle-Grade Monday round-up. Check out more great reading here. Review copy from publisher.